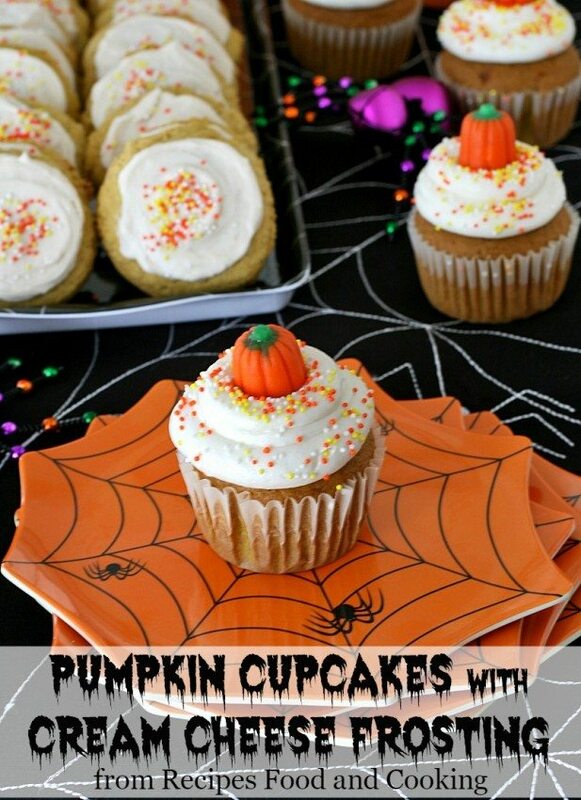 These yummy and spicy pumpkin cupcakes are sure to be a hit for a Halloween party or dinner with the family. They are frosted with a scrumptious cream cheese frosting that will melt in your mouth and have everyone asking for more. Plus, they are the perfect dessert for the kids for Thanksgiving as well! Halloween is one of my favorite holidays, I love all of the decorations! 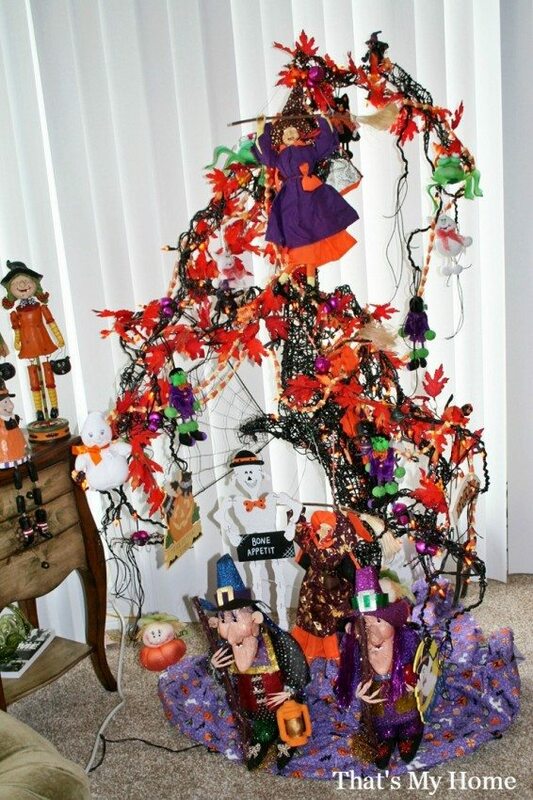 I decorate a tree every year full of witches, ghosts, bats and goblins. I used to use a Christmas tree to do this and they decorate wonderfully for Halloween. Doesn’t it make you in the mood? What other holiday can you decorate with bugs, spiders and such? I love bringing together every piece of a party. Our Pumpkin Cupcakes are definitely the leading dessert, but what’s better than having a party full of Halloween themed ideas. 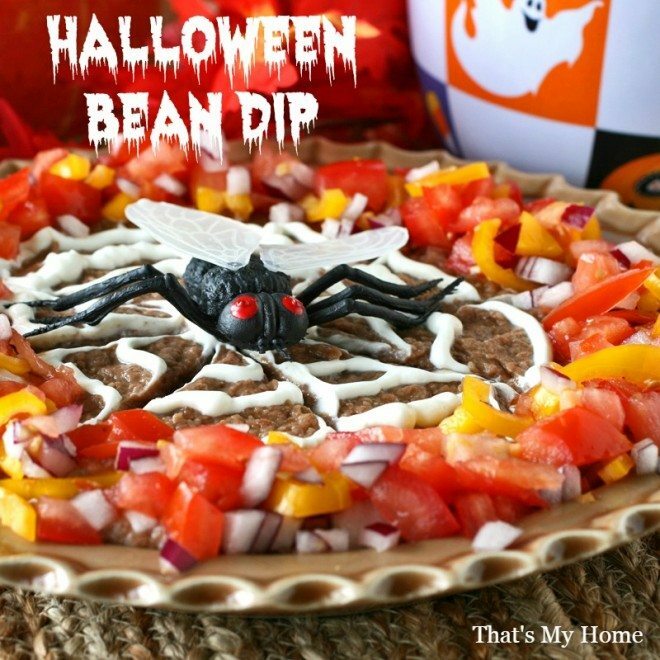 A perfect way to greet your guests would be with my delicious appetizer recipe for Halloween Bean Dip. How fun is that bug on top? 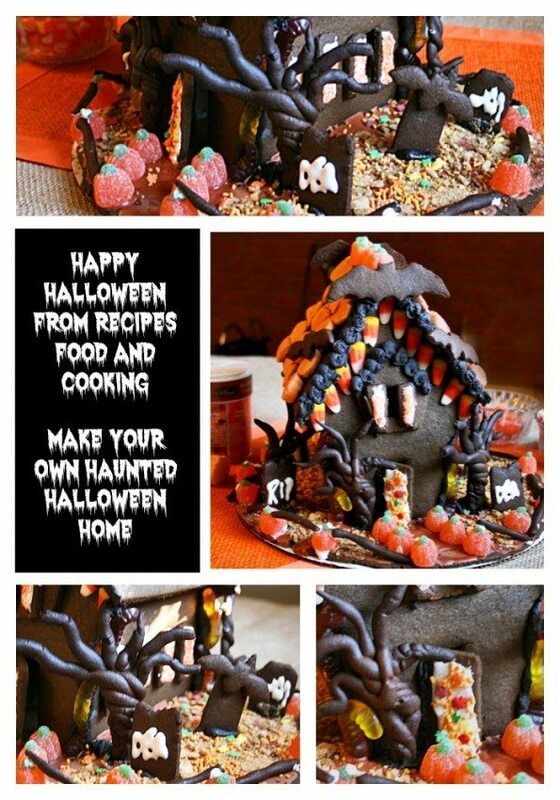 Next off you would definitely want to create your very own Haunted Halloween Gingerbread House. Just imagine the fun the kids will have! 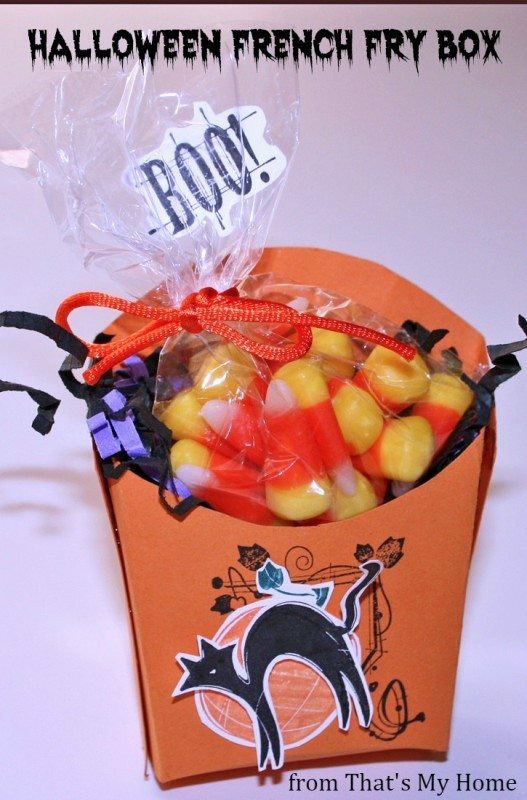 The perfect favor idea is this Halloween French Fry Box that makes the perfect quick and easy idea for a party favor that all will love. Be sure to grab the free template so you can make your own! Now for the main event of your perfect Halloween party, the desserts! Our Pumpkin Cupcakes are paired nicely with our Pumpkin Sugar Cookies that are so good. You just can’t beat a cinnamon cream cheese frosting on cookies! 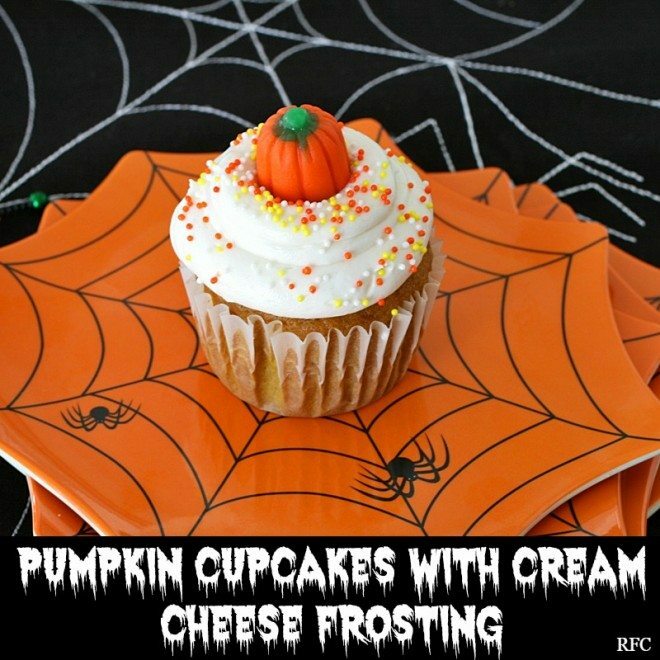 Pumpkin Cupcakes with cream cheese frosting make the perfect Fall Dessert. Add the sugar, brown sugar and oil to a mixing bowl. Mix until combined. Add the eggs, vanilla and canned pumpkin. Mix until well incorporated. Add the spices, baking powder, baking soda and salt to the flour. Stir in to the sugar, oil mixture and beat well for about 3 minutes. Place batter in cupcake liners filling about 2/3 full. Bake at 350 degrees for 15 – 18 minutes. To make frosting, cream together the cream cheese and butter for about 3 minutes. Add the powdered sugar, milk and vanilla. Beat for 5 minutes until frosting is light and fluffy. Pipe the frosting on the cupcakes and add sprinkles then top with a Halloween candy corn pumpkin. I love your idea of adding pumpkin on the top! These cupcakes look scary adorable! The pumpkin spice recipe will work for any autumn event…thank you!! pinned. These are so cute and I love that it is a from-scratch cupcake recipe. Pinned! http://www.isupermarket.in/ .. to check out Fresh Fruits & Vegetables, Grocery and Staples, Beverages, Confectionery & Dairy products, Fresh Meats, Personal Care and Household products.Shop online and save your money and time.